There are some community traditions you grow up enjoying. Then there are some traditions you don't discover until well into adulthood. Last night my family attended our first ever Downtown Advent Walk. The walk is a progressive ecumenical celebration among five historic churches in downtown Paducah. We began at Broadway Methodist Church for a short service then we walked to Washington Street Baptist Church for music and scripture reading. Then, we went to our home church of Grace Episcopal Church for more choral music and a short sermon. Last on the walk were services at St. Francis de Sales Catholic Church and First Presbyterian Church. It was such a special thing to be out on the streets of Paducah with so many people from the community. However, it was more than that. It is not very often that one gets to experience so many different churches and worship styles in one evening. I couldn't believe how few churches I had worshiped in in my own town. There were so many buildings I'd driven by a thousand times but never actually stepped foot in. I recently read an essayist who argued we all want to rush Christmas because it's one of the few remaining communal celebrations in our society. As I celebrated advent with my town yesterday evening, I knew exactly what he meant. I'm already counting the days until next year's advent walk. I know what y'all think. Even if you won't admit it to me, you think there's not a lot to do in Paducah. We've got quilts and barbecue and we've got our very own film festival! Founded nine years ago, the River's Edge International Film Festival is dedicated to showcasing quality independent films from around the world. For three days in early November, Paducah becomes a hot spot for theatric artistry and cinema innovation! Run by our small arts cinema, Maiden Alley Cinema, and staffed entirely by volunteers, the River's Edge International Film Festival screens every type of film from features to documentaries to animated shorts. So, if you love film and have been looking for a reason to visit us in the Western part of the state now's your chance! For more history of the film festival and insider's tips, check out Paducah Life Magazine's cover story on the film festival from 2012. 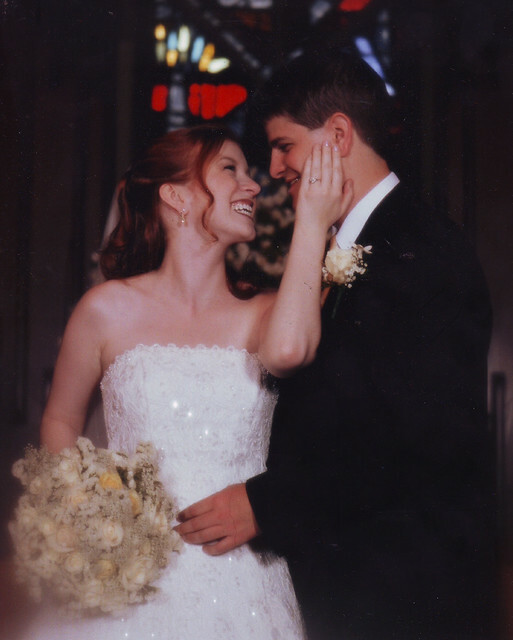 In "maiden alley", "paducah", "rivers edge international film festival"
My husband and I are celebrating ten years of marriage this summer with a vow renewal ceremony in July. Before I share the specifics of that party, I thought I would share some of the fun Kentucky details of our first ceremony a decade ago. We got married in my hometown of Paducah, Kentucky, and I wanted our guests to feel my love for our locale. Out-of-town guests got the customary gift bags filled with local products. Everyone received Starnes BBQ sauce, a little Paducah pin, and some chocolate from a local shop. I used Queen Anne's lace in my wedding bouquet as a send up to the local wildflower that grows like weeds in the hot months of a Kentucky summer. Even better, I'm reminded of our wedding every year as it springs up along roadsides and fills fields near my home. The day of our wedding a summer rain storm came drenching the area and sending me into hysterics. Luckily, the rain stopped before our reception which was held in a restored home, with half of the tables being set up outside under the trees. Unfortunately, the rain turned the already hot day into a sauna-like evening. We had a signature bourbon cocktail to help our guests to cool down. It was called a Trolley Cooler as a send up to the Paducah trolley car we took from the church to the reception. The cocktail was a shot of bourbon with a 1/2 cup pineapple juice and a 1/2 cup of cranberry juice. However, our "bartender" (who was really just a family friend) began partaking of the Trolley Coolers and by the end of the evening it was more like a cup of bourbon with a splash of pineapple juice and a splash of cranberry juice! However, I think the crowd favorite of Paducah-specific details was our end of the evening treat. After a night of dancing (and bourbon), we pulled out coolers of Dip 'n Dots for our guests to enjoy as a final treat. Dip 'n Dots were invented and are manufactured in Paducah so I knew we had to include them. For years, I would have guests comment on the Dip 'n Dots and how much fun it was to have them at the end of the night. I wish I had Style Me Pretty worthy photos of all these details but alas my wedding was before the age of photojournalistic style documenting of every little flower and flourish. Still, my memories are happy and I hope ten years later our guests still remember having a good time in the little town of Paducah, Kentucky. It's beginning to look a lot like...QUILT WEEK! 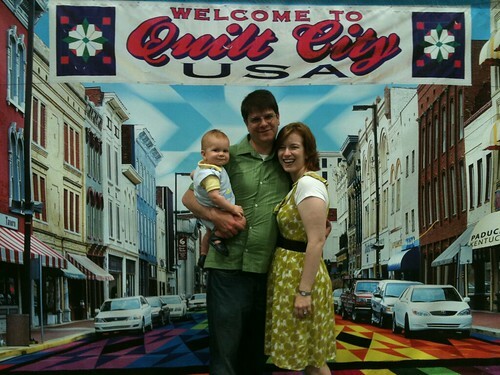 In "aqs quilt show", "paducah", "quilt convention", "quilts"